This page is a translated version of the page Aurora and the translation is 100% complete. Aurora has been one of the first Italian fountain pens manufacturers and between the oldest Italian company operating in this field. Among the countless small fountain pens manufacturers born at the beginning of the century, Aurora has been able to lead in production quality and industrial initiative, becoming a company that can contend the rival OMAS the title of the biggest producer of Italy. The company was founded in Turin in 1919 by Isaia Levi, and it is still present on the market as an independent producer of writing instruments. The production has always been of the best quality, and although the company did not create any revolutionary technical innovation, its pens have always been between the most original and innovative for their style and design, and so they remain among the most appreciated and sought by collectors. 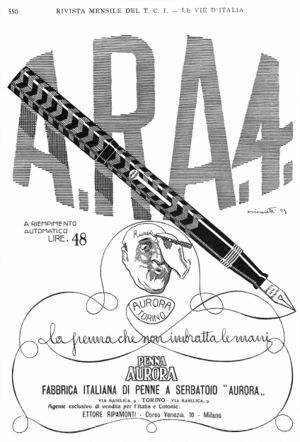 Aurora was founded in 1919 in Turin, as Fabbrica Italiana Penne a Serbatoio Aurora, by Isaia Levi, a wealthy financier and merchant of tissues, which after the end of the First World War decided to invest in the writing instruments production. Levi already saw the presence of many small producers in the industrial district of Settimo Torinese, but decided to give his company a precise direction towards an industrial production that should be at vanguard in both technical and qualitative terms, but also with a strong push towards the marketing of its products with large advertising and a strong support for the sales network. The company was born as an Italian producer, imitating the Americans pens models of the same period, but it immediately got a good success for its production quality and for the functionality of its pens. In particular, in a period of strong nationalism and autarkic policies under the fascist regime, the company made a strong leverage in its promotional materials, that its pens were not subject to customs duties, having the advantage of a lower cost. An Aurora advertisement from '20s. The initial production was made of hard rubber models with the classical eyedropper or safety filler, clearly inspired by the pens produced by American companies like Waterman that at that time began to be marketed in Italy. These were black hard rubber pens in or smooth or chased version, and also, but much more rare mottled models. There were also luxury models in gold plated or laminated metal overlay, and also in full gold, which quality had nothing to envy to the pen produced by the more famous American brands. 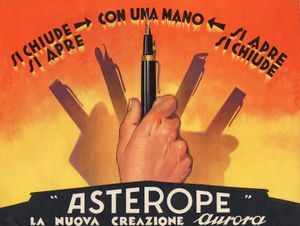 In the '20s the company began to produce lever filler hard rubber pens: the A.R.A model, standing for Aurora a Riempimento Automatico had a great success beyond the Italy boundaries and led Aurora alongside the major European manufacturers. At that time, the company followed the common practice of European producers who saw them build models similar to those marketed by big American producers, who then dominated the stylistic trends and technological development. But although they were obvious imitations, these models often ended up to be well above the original production for their quality or for specific stylistic achievements. In the mid '20s also Aurora started production of celluloid pens, and in 1927 introduced the Duplex series; for its name was called a contest, the outcome of which was not then used. The pen was a lever filler, proposed in four measures. I was a clear imitation of the Duofold with the cap head in black hard rubber and a ball washer clip. But unlike the Duofold the top models of Duplex have a metal clip with enchased with a fine filigree decoration, which makes the Duplex a real jewel of the Italian style. In 1929 the company was restructured taking a strategy of trade diversification; on that occasion were created two new sub-brands: the Olo, which later become an official sub-brand, which was focused on the production of economic pens, cheaper than the Aurora branded, sold outside the stationeries, and the ASCO, dedicated to the production of very economic pens for the lower end of the marked, initially aimed to produce advertising or promotion fountain pens, for the gift items market, but then expanded in the mail orders market. Responding to the international success of the new streamlined style, Aurora started redesigning of its own models, that saw the gradual abandonment of flat shapes. In 1930 the new Superba model was introduced, still a lever filler, and clearly derived from Duplex, but with tapered ends characterized by a very original style. The pen was produced only in the pearl and black, red and lapis colors, and remained in production for a very short time, which makes it very rare and highly sought. A 1932 advertisement for Le Duo Moderne. In the early 30's Aurora sought to expand in the international arena and to enter the Spanish and French market. There are also Aurora's pens found in Latin America, the result of export policies to countries like as Argentina and Brazil. 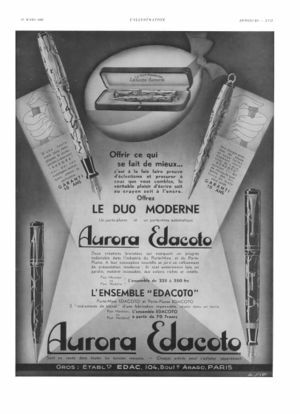 In 1930 the company reached an agreement with Edac, producer of Edacoto, for marketing in France the Le Duo Moderne, a set consisting by an Aurora fountain pen and an Edacoto mechanical pencil. In December 1930 there was also the birth of the Internazionale model, also a back lever filler, who was used also for Le Duo Moderne. The pen, produced in four sizes and in a broad mix of colorful celluloid, has a wide metal band between two rings, decorated with a Greek motif. In the same period several pens intended for the export market, particularly for the French market, were made; they are in general quite similar to the Duplex, both in style and for being lever filler. A second series Novum model. In 1933 was introduced the Novum model in two versions, with smooth or faceted body and cap, produced in a variety of different celluloid colors. The pen had a particular back lever filler system and a special security clip, present on the larger models, that at the insertion of the pen in the pocket triggered an hook that clipped the outside of the pocket fabric to prevent accidental exit, and that should be released by pulling forward the tip of the clip. With several variations the pen remained on the market until the early 40's. The Asterope model was introduced in 1934, two years after the similar design of the Pullman model by Météore. This pen can be considered an ancestor and forerunner of the Capless, produced by Pilot 30 years later. The pen had no cap; the nib could be moved inside the body of the pen, through a side slider, and was protected by a closing lid that opened when the nib was extracted. The pen had some success for its characteristic of being usable with one hand alone. Another famous model, much sought by collectors, is the Etiopia, that was reported to be introduced in 1935 during the Abyssinia invasion made by the fascist regime in its policy of colonial expansion. It has been told that in that occasion Aurora, which was rather linked to the regime using its slogans in the advertising, launched a special pen for the soldiers sent to Africa. Because of this the pen was an eyedropper filler equipped with a reservoir on the barrel to hold dried ink tablets. The ink could be obtained dissolving the tablets in the body of the pen adding water. The pen was made of white celluloid and the cap had an incision of the roman empire eagle mark. But the story of a pen made for the soldiers sent in Africa, often used to underline the importance and rarity of the model, is just a fake, because the Etiopia was introduced only in 1936, when the war was already finished. So the model was just a clever marketing move, done to take advantage of the war propaganda, and also if Etiopia in not so common, it cannot be considered between the most rare Aurora models. In 1937 the Superna model was introduced, with a variation of back lever filler, in which the lever was equipped with a small ball on the outer extremity and mounted vertically in a semi-spheric alluminium structure located on the bottom of the pen. The ink loading was carried out by removing the back cover to access the the lever and operating it through the ball. In 1938, following the visualated pens trend showing the ink level started by the Vacumatic, Aurora introduced the Optima model, a plunger filler made of transparent celluloid, which remained in production until the early '40s. Another model of the same year was the Topolino, a simple button filler entitled to the Disney character, featuring a Mickey Mouse engraving, and oriented to youth people and students, soon paired with Biancaneve. From the same period should be noted the Iridia model and the ML line introduced in 1938, produced, at least officially, for the armed forces officers. The Second World War was a crisis period for business: the curtailment of raw materials, and the difficulty on gold procurement, led to the creation of steel nibs. As it happened to other companies Aurora sought to replace the lack of material inventing precious names, and called its alloy steel Platiridio. In 1939 the Selene, a button filler model, was introduced; it was made in celluloid with white metal finishes and a Platiridio nib. The company, unlike the rival OMAS, suffered heavy damage from bombing, the plants in Via Basilica were destroyed in 1945 and raw materials and archives were lost. But despite this after the war there was a great effort to rebuild the business. At the end of 1946, following the new market trends dictated by the Parker 51, Aurora introduced an hooded nib model. The design of the pen was entrusted to the architect Marcello Nizzoli: the 88 was a masterpiece of the Aurora production, and obtained a great success. The 88 model was equipped with a very advanced piston filler, with differential threads. The pen was made with a metal cap in both gold-plated metal or using an alloy of nickel and silver called Nikargenta. The body was in celluloid with a transparent section, while the handle of the piston was in hard rubber. The 88 was qualitatively and technologically far more advanced than a 51, the only plastic part was the sheath of the nib, and the feeder had a sophisticated supply system which allowed a regular ink flux. In 1954 (or in 1957), to counter the massive advent of the ballpoint pens, Aurora launched the Duo-Cart, a cartridge filler economic model. The cartridges were carried out in polyethylene, and designed by Giulio Natta, Nobel prize for chemistry. The distinguishing characteristic of the pen, exposed by the name, was the ability to contain within its barrel a second cartridge, to avoid to get out of ink. Following the same design the 888 was also introduced, a cartridge filler version of the 88. In the following years the advent of the ballpoint pen affected the production in a ever more massive way. The company was sold to the family Verona in the early '60s, but always remained active in the market, starting to produce ballpoint pens. In 1963 was introduced the 98 model, still a piston filler equipped with an additional reserve of ink called Riserva Magica which allowed to obtain a few drops of ink when the tank was empty. In 1965 the economic line Auretta was introduced, a cartridge filler produced in colorful plastic and directed especially to students. The last model of historical significance is probably the Hastil, designed by the famous architect Marco Zanuso and launched in 1970. It realized an huge international success, so that a copy of this pen is permanently exhibited at the Museum of Modern Art of New York. Made with a thin cylindrical steel body, the pen is characterised by an advanced feeder (called Idrograph), by a nib mounted in a central position and by a cap with a peculiar retractable clip that falls within the cap when at rest, but that can be open when the pen must be inserted into a pocket. In the following years the company has remained on the writing instrument market producing quality products, expanding its production to ballpoint and roller pens, and occasionally making new fountain pens models. To date, the Aurora remains between the major Italian pen manufacturers. 1922 the company publish the first catalog, with all its models: R.A., A.R.A., F.A. e F.A.S. A Turin CCIA (chamber of commerce) publication, interesting. Company web site, no valuable historical info, only marketing on actual models. ↑ there are some wrong references to this series as the Internazionale, for example in the Enrico Castruccio book La Penna. ↑ contrary to what Luca De Ponti argues in his book, the name chosen by the contest was not Duplex, but "Alata", as evidenced by this advertisement. ↑ date is debated, Luca De Ponti says 1932, Letizia Jacopini says a period between 1931 and 1932, but as reported in the following the Internazionale model appears in a December 1930 French advertising, from which we use this date. ↑ according to what reported in this thread it is shown in a December 1930 ADs in the L'illustration francaise magazine. ↑ another incorrect story tells that gold was prohibited by law from 1937 because the autarkic program of the fascist regime, but no such law existed and gold nibs pen are reported to be on catalogs up 1941, along with Platiridio nibs and ordinary steel nibs (marked Durium). ↑ someone tell 1940, so this dating is not fully confirmed.